One of the features common to much of the reporting of the trial of the Norwegian mass-murderer Anders Breivik is that folk seem all too willing to accept that his hatred of 'multiculturalism' is the key motivating factor for his actions. Then, having taken Breivik’s line at face value, some commentators are unable to resist the temptation to place all of those with views that are not necessarily entirely supportive of 'multiculturalism' on a continuum that has, at one end, angry letters to the Telegraph and, at the other, the slaughter of innocent civilians. This is nonsense, just as it is nonsense to place law-abiding Muslims on a continuum with people who blow up buses or hi-jack planes. This trial has provided no revelations about a sophisticated international network of far-right bloggers and bombers, but is proving to be a chilling illustration of Hannah Arendt’s phrase about the ‘banality of evil’. Accordingly, some of the analyses of Breivik's motives would make just as much sense had he cited the Flying Spaghetti Monster as his biggest influence. The truth is that there is no 'because' worth analysing for any man who can murder 77 people in cold blood. If you need a ‘because’, then he killed those people 'because' he's a deeply disturbed individual, but he didn't become a deeply disturbed individual 'because' he read some right-wing blogs. 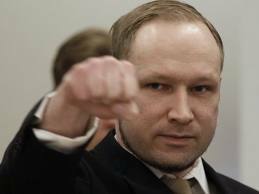 If there had been no multiculturalism to rail against, Breivik would have found another reason to do it. Until we perfect humankind (and I understand that that is due to happen sometime around the 12th of Never), people like him are going to do things like that every now and then. To react in a sober way to an aberration of nature like Breivik, we need to develop and maintain robust political dialogues that have no areas deemed ‘off limits’ by the political and chattering classes. We have to be confident enough to make the distinction between, on the one hand, the desire to live in a multicultural society and, on the other, belief in the tenets of 'multiculturalism'. These are two entirely separate concepts. I want to live in a multicultural society and I think the UK does pretty well when it comes to integrating minority groups. Our country is all the richer for the various contributions made by folk who have arrived here from overseas. I don't, however, believe in multiculturalism, which I take to be the belief that all cultures have equal rights and equal status. All cultures and sub-cultures are not equal at all times in all places. If I moved to Madrid or Nairobi or Islamabad or Riga, I'd expect to adapt my beliefs and practices to the cultural mores and laws of the host country. When the Archbishop of Canterbury -in his infamous 'sharia law' speech in February 2008- asked how it might be possible for civil law to accommodate some of the legal procedures by which Muslim communities in Britain have traditionally regulated relationships and financial affairs, he was (directly or indirectly) advocating multiculturalism. I'd suggest that the logical destination for that philosophy would be the establishment of a society (or rather a series of mini-societies) wherein one set of laws might apply to one group of people, with other sets of laws applying to the rest. And that would make about as much sense as belief in the Flying Spaghetti Monster.